An urgent update to the story of 81-year-old housing co-op resident Tony Healy, whose case is detailed below. The council are very aware of Tony Healy’s vulnerability and his state of mind and visited him on 2nd March 2016 with doctors and police trying to convince him to move voluntarily – but they still went ahead with sending bailliffs to forcibly move him on Friday 4 March. He completely gave up hope and didn’t ask for anyone to support him on Friday morning. He has no family, nowhere to go, and he has lived in the co-op for 30 years. He has totally given up on life since being told he has to leave. The only reason he is being moved is for Lambeth to sell the property along with the other co-op houses in the street. Tony needed a commitment from Lambeth that they will not evict him – the council are putting his life in danger. That commitment did not come and on Thursday night Tony, returning from a local shop, found that someone had entered the property and left a note saying that he would be sectioned. The note said that this could not again be acted upon within 3 months. Tony was happy within his community and never did himself or anyone else any harm. It was only the threat of eviction that mase him feel that life was not wort living. A fact we made abundantly clear to Lambeth and has been clear to them for some time. Last night, at 1am, Tony was taken to hospital. We later found out that another section order had been raised. Neighbours and former neighbours have now visited him in hospital and discovered that he has broken his hip and arm. Meanwhile, strenuous efforts are being made to find out if Tony will be allowed to go back home and back to his belongings and his precious artwork (see below). A reminder about what happened last year with Tony’s case…will Lambeth never learn? The 4 Vauxhall parliamentary candidates – from the Conservatives, Greens, Labour and the Liberal Democrats – have joined together in unique show of unity to raise the fate of the remaining ‘shortlife’ housing co-op residents who are either vulnerable themselves or have vulnerable family members. Please see below the text of the letter to Lambeth Chief Executive, Sean Harriss, from the candidates. A PDF scan of the candidates signatures can be provided on request, the reason it has not been provided here was to avoid releasing private address information. You may not yet have been briefed about Lambeth Council’s policy of evicting longterm ‘Shortlife tenants’ of former Co-ops. Eighty-year-old Lambeth resident Tony Healy, who lives at [name and address supplied] is currently under threat of eviction due to the council’s policy of ‘shortlife recall’ which has affected a number of OAPs. in the borough. As he was unable to obtain Legal Aid, Mr Healy recently represented himself in court to defend his house of 30+ years against Lambeth Council, but he lost the case. During his time living in his community, Tony turned his house into an art installation with fantastic wall decorations that have been lovingly put together. A PDF of some of his work is attached – Tony Healey. Not only is his home under threat, but so is an unique feature of the local area and community. Tony’s remaining neighbours want Tony, a vulnerable and eccentric OAP, to look after himself and the best way to do that is for him to know that his art will be cherished and also his home of 30 years. As I am sure you know, moving elderly residents, especially in traumatic circumstances, can have a very detrimental effect on their life expectancy. While his neighbours have attempted to give some assurance about satisfactory rehousing, they, of course, understand his determination to stay and that the best assurance of safeguarding his work would be to let Tony live out the rest of his natural life in his home. Now that the council has raised more than projected by the sale of ‘shortlife’ housing co-ops – although it has not indicated where this money is going – it is time to re-assess the action against the remaining residents who have not taken up rehousing. All of these people live in houses that are amongst some of the best examples of tenant-improved properties in the borough. Furthermore all have played an active role in their communities over the years. We strongly believe that a way should be found to allow these residents to remain in their homes where exceptional circumstances apply. This is not a matter of political policy but of finding a compassionate way to solve this issue. We look forward to your response on this and hope that constructive and pragmatic solutions can be offered. We would be quite happy to meet with you if that would be helpful. 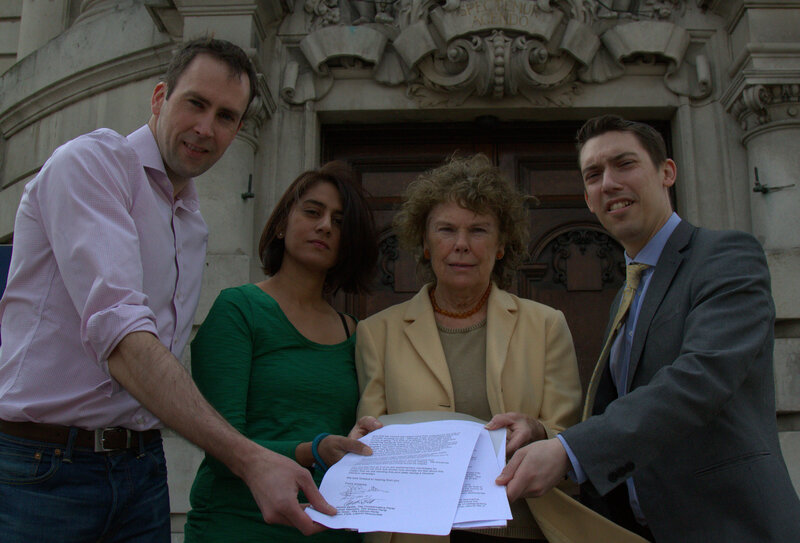 You will see that all 4 of us are parliamentary candidates for Vauxhall and we think this shows how strongly we feel about this matter that we are sending this joint letter during a General Election campaign.